El Paso, TX – On Saturday, February 09, 2019, Sheriff’s Office deputies responded to NW J Ave and Mesa Canyon Dr. in reference to multiple hit and run incidents involving multiple vehicles. Deputies were advised by witnesses that a Dodge Charger had struck four parked vehicles in various locations throughout the neighborhood. Deputies conducted an investigation and located the vehicle with significant front end damage and conducted a traffic stop at the intersection of Mesa Sands St. and Mesa Canyon Dr. Upon making contact with the driver Sarah Macias, age 43, deputies determined she was intoxicated and took her into custody. 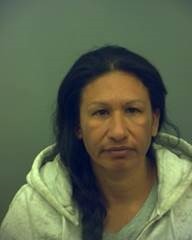 Macias was booked into the El Paso County Detention Facility for DWI 3rd or more.